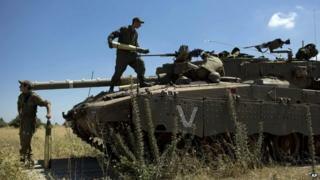 The Syrian Foreign Ministry said the Israeli air strikes had killed four people and wounded nine others. Israel called the boy's death the most substantial incident in the Golan since the Syrian conflict began in 2011. Two others, including the boy's father, an Israeli defence contractor, were injured in Sunday's blast, which struck their vehicle. It is unclear whether Syrian rebels or government forces were behind the incident. Israeli military spokesman, Lt Col Peter Lerner, told the Associated Press news agency the attack from Syria was "clearly intentional" but it was unclear whether the blast in the area of Tel Hazeka near the Quneitra crossing was the result of mortar fire, a roadside bomb or shelling. He described it as "an unprovoked act of aggression against Israel and a direct continuation to recent attacks that occurred in the area". The Israeli military said its air strikes targeted Syrian army positions, including a military headquarters, in response and that "direct hits were confirmed". The Syrian Foreign Ministry has condemned the Israeli air strikes, calling them a "flagrant violation" of its sovereignty. In a statement, it said the strikes were a sign of the "direct and continuous support" that Israel is giving to rebels fighting against Syrian President Bashar al-Assad and urged the UN to condemn the attacks. The Syrian Observatory for Human Rights had earlier said that at least 10 Syrian soldiers were killed during the Israeli raids. The teenager killed in Sunday's attack, an Arab Israeli, has been named as Mohammed Qaraqara. "He was an excellent student; everyone loved him," his cousin Salah Qaraqara told Reuters. Israeli Prime Minister Benjamin Netanyahu said: "Our enemies don't differentiate between Jews and non-Jews, adults and children." The Golan Heights, a rocky plateau in south-western Syria, was seized by Israel from Syria in the closing stages of the 1967 Middle East War. The two countries remain technically in a state of war, and UN observers are deployed to monitor a 70km-long (45-mile) demilitarised zone. Firing linked to the Syrian conflict occasionally reaches the Israeli side of the border fence - some unintentional, some said to be deliberate. In March, Israel conducted air strikes against several Syrian military targets after a bombing that injured four of its soldiers in the Golan Heights. Israel had accused the Syrian army of "aiding and abetting" the attack on a patrol near the ceasefire line. Syria said one of its soldiers was killed in the Israeli military response. Some of Israeli's recent air strikes are believed to have prevented the transfer of stockpiles of rockets from the Syrian government to Hezbollah, the Lebanese Shia Islamist movement that supports President Bashar al-Assad.